Rajasthan, the land of deserts, camels, colourful turbans, delectable food, warm people, folklore royal palaces, is also famous for its grand forts. The majestic forts of this enchanting state are the truest symbol of its glorious past. They are not just sagas in stone but also a testament to the heroism and indomitable spirit of the Rajputs, the mighty warrior clan. 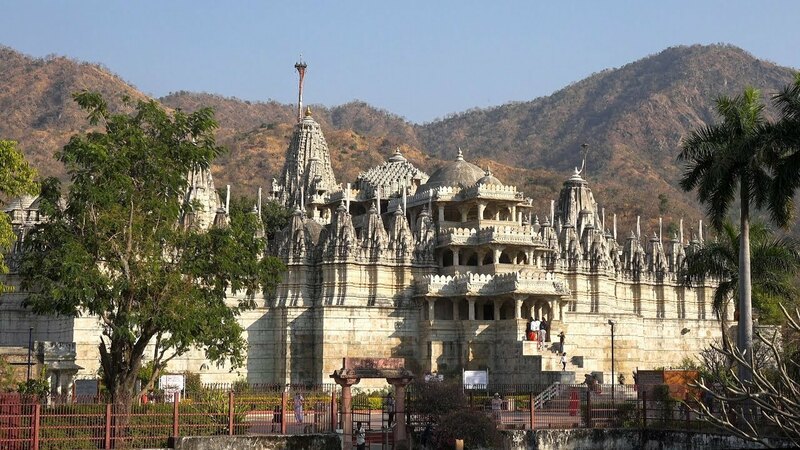 But if there is one fort that personifies the spirit and grandeur of Rajasthan more than anything else, it is the impressive and overwhelming Kumbhalgarh fort in Rajsamand district. The fort is engulfed by thirteen elevated mountain peaks and its fortifications, palaces, gardens and temples render it absolutely magnificent. The impassable fort is designed with seven enormous gates, seven ramparts folded with one another with designed walls that have been strengthened by curved bastions and gigantic watch towers. It was Maharana Kumbha who undertook the construction of this architectural marvel in the 15th century. 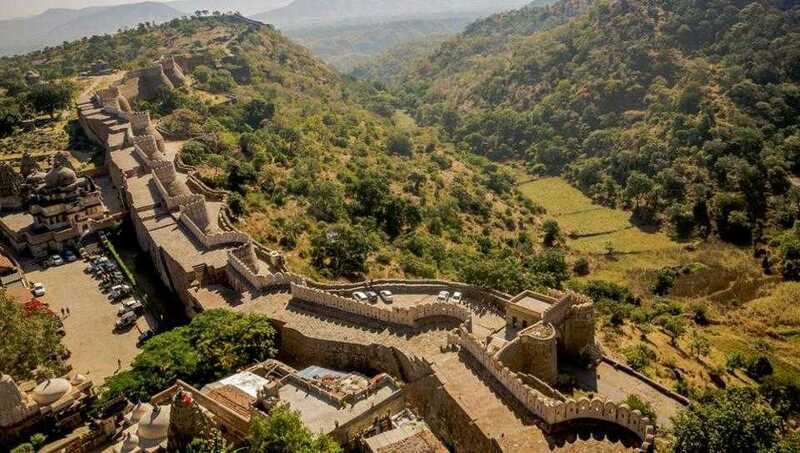 The 36 km wall, which is the second longest wall, after Great Wall of China, is circular and surrounds the Kumbhalgarh fort. This fort, which is known as the Great Wall of India, is also the birthplace of legendary Maharana Pratap. The fort has over 360 temples scattered within its boundary walls. The fort has added to the list of UNESCO World Heritage sites in 2013. A two-and-a-half-hour drive from Udaipur, Kumbhalgarh rises like a clenched fist in the face of the sky. 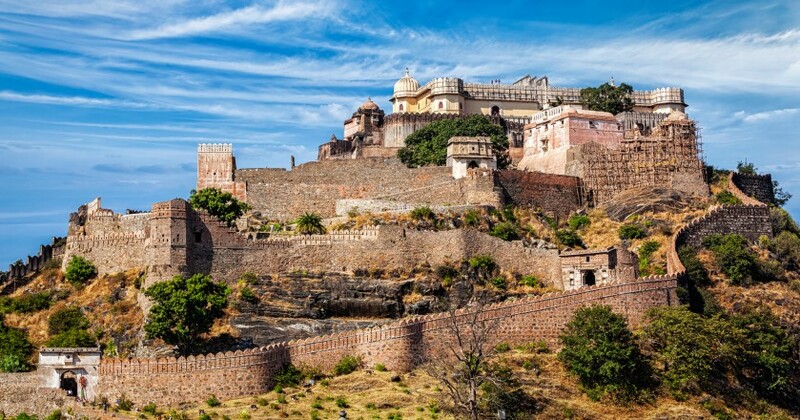 Perched at over 6,233 feet above sea level at the tail end of the Aravalli Range in Mewar, the fort affords sweeping views of the dusty plains of Marwar. It is said that Rana Kumbha, is the one who have established 32 of the 84 major fortifications in Mewar. Kumbhalgarh is the true icon of Rajasthani forts, even more impressive than the more well-known Chittorgarh. As the area is very vast, it may take 2 to 3 hours to wander along the fort. 50 km away there are the Jain Temples at Ranakpur, which is reputed for the 1,444 intricately carved supporting pillars, and a Sunset Point, which is 6 Km way, where you can go and the sinking sun. There is a 578-sq-km wide wildlife sanctuary which invites exploration by jeep or horseback. The winter months from November to February are perfect. The rainy season (July-August) is also a great time when the entire landscape is magically green and the weather is pleasant. The nearest railway station and Airport are at Udaipur, which is 84 kms from Kumbhalgarh fort. Udaipur is a major city well-connected with all metros via rail and air. Kumbhalgarh fort is a 2 hour ride from Udaipur via road. The visiting time to the fort is 9 am to 5 pm. Tourists have to pay an entry fee to visit the fort. Tourists from India, SAARC countries to pay Rs. 15 while the tourists belonging to other countries have to pay Rs. 200. Tourists also have to pay Rs 100 to watch the light and sound show which is conducted only in Hindi language.